Jesus came to die for our sins. … and He also spent those three years avoiding getting Himself killed for it. If Jesus was born to die, what was he waiting for? I point this out to show the importance of Jesus’ teaching. Yes, spreading His teachings was worth dying for, but their is a second reason, which we often miss. Jesus could have been arrested and/or killed many times before Good Friday. However, Christ had to teach us many things and He had to create a Church to pass along those teachings until the end of time. He needed to do this first, before His death on the Cross. So, as Christians, we must ask ourselves, do I value the teachings of Christ’s Church? 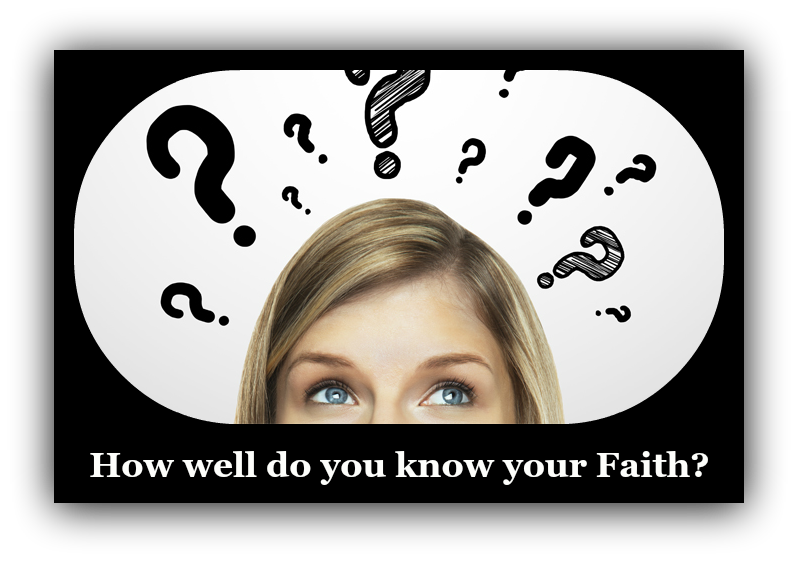 If I do, how well do I know about the Faith? No matter how well you know the Faith, you can always learn more! Check out the many opportunities to learn under the “Adult Catechesis” tab on this website. Below is a little quiz to test your knowledge of the Catholic Faith. After you answer each questions you can submit your answers with your email and we’ll send you the results. If you wish, you can just check the answers on your own. Answer each question the best you can. The place a soul goes after death when it has imperfections it needs purified. A place of suffering the Church no longer teaches is real. The place a soul goes before it enters Hell. The last rite of passage one goes through before death. When it teaches about salvation, the Bible has no error. When it teaches about morals, the Bible has no error. When it teaches about history, the Bible has no error. Whenever the sacred authors of Scripture affirm something to be true, the Bible has no error. Same way it ends up in Heaven - it chooses to go there. God sends it there for their sins. A soul can't go to Hell. Asking the saint to perform a miracle. Asking the saint to grant us a special grace. Asking the saint to pray for us. Asking the saint to make us holy. The conception of Mary without original sin. Just show me the answers.